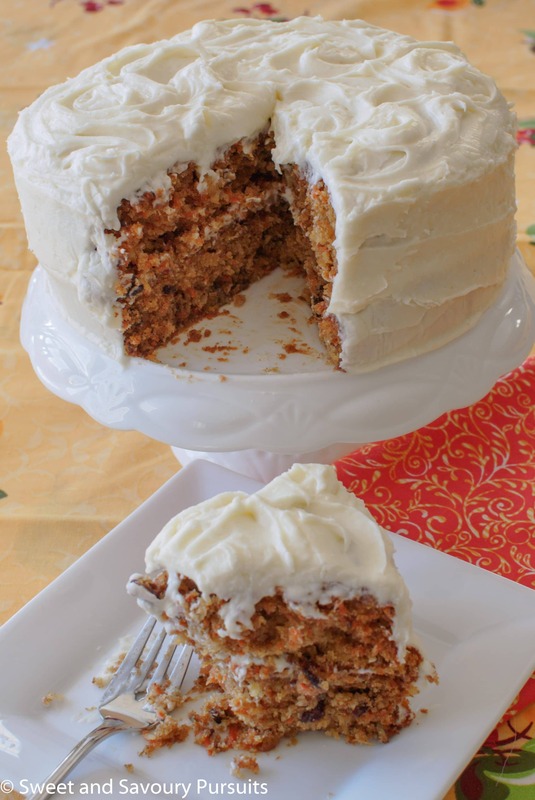 This moist and dense Carrot Cake with Cream Cheese Frosting is one of the best carrot cakes you will ever taste, the cream cheese icing is simply amazing! 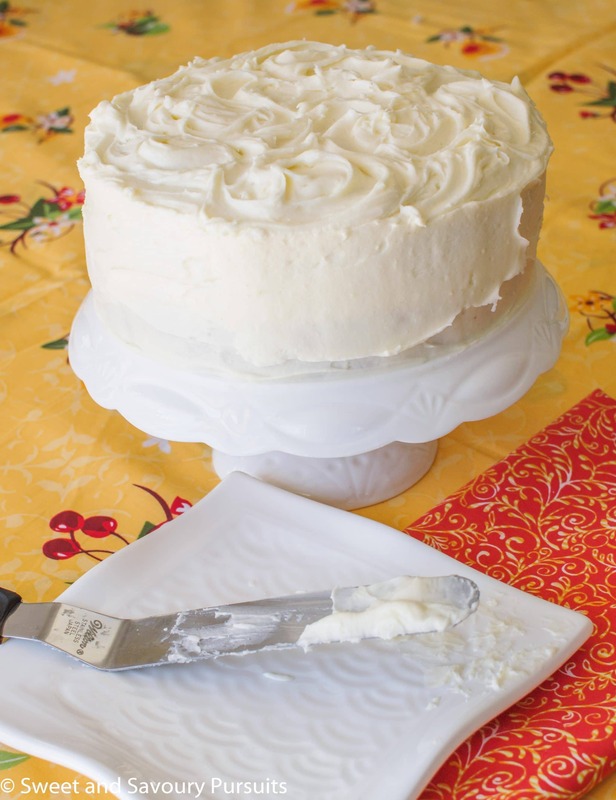 This is my favourite recipe for Carrot Cake and Cream Cheese Frosting. It is by far the most delicious carrot cake I’ve ever tasted. The cake is moist and dense and the cream cheese frosting has a nice tang to it which makes this cake taste so absolutely amazing! This recipe deviates very little from the original recipe entitled Canada’s Best Carrot Cake with Cream Cheese Icing from Canadian Living. I have made the carrot cake from Canadian Living several times just the way it is and always get so many compliments for it. I think sometimes a recipe is so good that there really is no need to change it. However, I have been wanting to try a couple of different things with this recipe, minor tweaks really. First, I wanted to substitute some of the white flour for whole wheat pastry flour and second, I wanted to see what the addition of some shredded coconut would add to the flavour and texture of this cake. I also substituted a bit of the granulated sugar for some pure maple syrup. I think my version of the carrot cake is equally delicious. 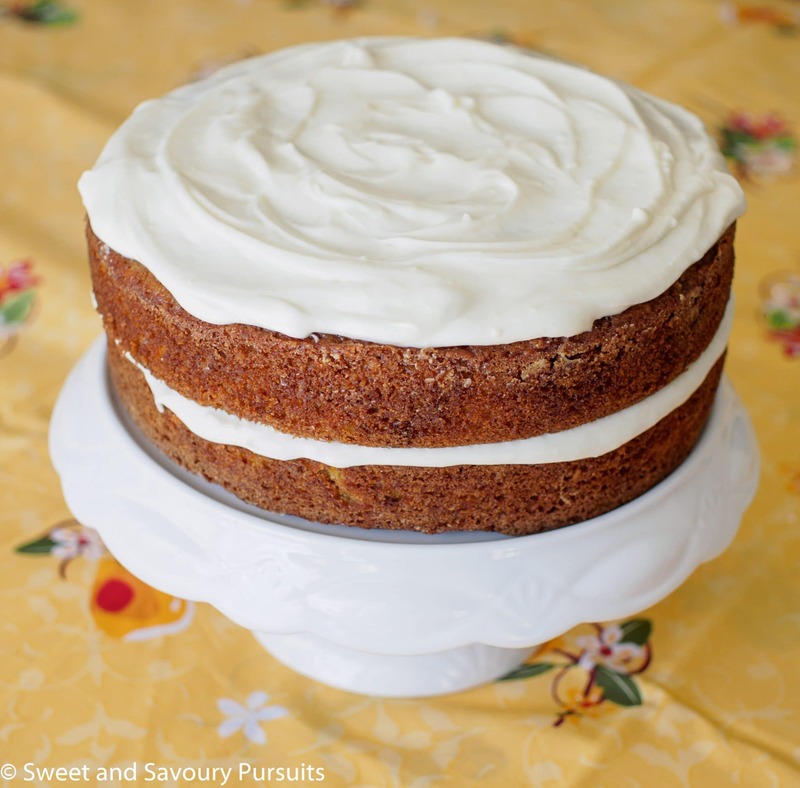 You can judge for yourself, the original recipe for the carrot cake with cream cheese frosting from Canadian Living can be found here. If you love carrot cake but want something with fewer calories take a look at this Carrot Muffin recipe, delicious and healthy! By the way, you can now follow Sweet and Savoury Pursuits on Facebook. Position a rack in the centre of the oven and heat the oven to 350°F. Grease and flour two 8 inch round pans or one 9×13 inch cake pan. In a large bowl, combine both flours, cinnamon, baking powder, baking soda, nutmeg and salt. In another bowl, beat brown sugar, granulated sugar, maple syrup, eggs and oil, until there are no more lumps. Add the dry ingredients to the wet and stir with a large spoon until evenly incorporated. Add the grated carrots, crushed pineapple, shredded coconut and pecans. Divide the batter into the *two round pans or the one rectangular pan depending on what you prefer. Spread the top so it’s smooth. Bake until a toothpick inserted in the cakes comes out clean, about 28 to 30 minutes, for the 8 inch round pans and about 35 to 40 minutes for the larger 9×13 inch pan. Cool the cakes in their pans for 10 minutes and then run a knife around them before inverting the cakes onto a wire rack to cool. Add the lemon juice, heavy cream, and vanilla extract, beat for 1 more minute then add the salt and one cup of icing sugar at a time until you have the desired consistency, I used 4 cups of icing sugar. The cake can be baked a day ahead of time and frosted on the day of serving. Once frosted keep the cake refrigerated. *When making layered cakes I always like to weigh my pans so that I know I have the same amount of batter in each, this way you get even layers. **I find that when using the icing for a layered cake it is better to add more icing sugar to have a stiffer icing which holds better on the sides of the cake. However, if you are serving this cake in a 9×13 inch pan, 3 cups of icing sugar is sufficient for the frosting. This is such a wonderful combination. Thanks for visiting my blog, really glad to meet you, love your recipes, new fan! Thanks! It’s really the best I’ve tried. That is the best carrot cake I ever tried!! Moist and delicious!! Thanks! I would love to know if you give one a try! Oh good! Thanks for stopping by. I love carrot cake–and picked up some carrots at the store yesterday since I’m out of my shredded farm share freezer stash. That’s great, I hope you’ll give this recipe a try! If you do, please let me know how you liked it. Thank you so much. Thanks for stopping by! Your photos make me wish I could jump in and grab a nibble! It sounds delicious and perfectly spiced. And in my personal opinion, one can never go wrong with cream cheese frosting. Thanks for sharing it with us over at Fiesta Friday! Thank you! I agree cream cheese frosting is so delicious! 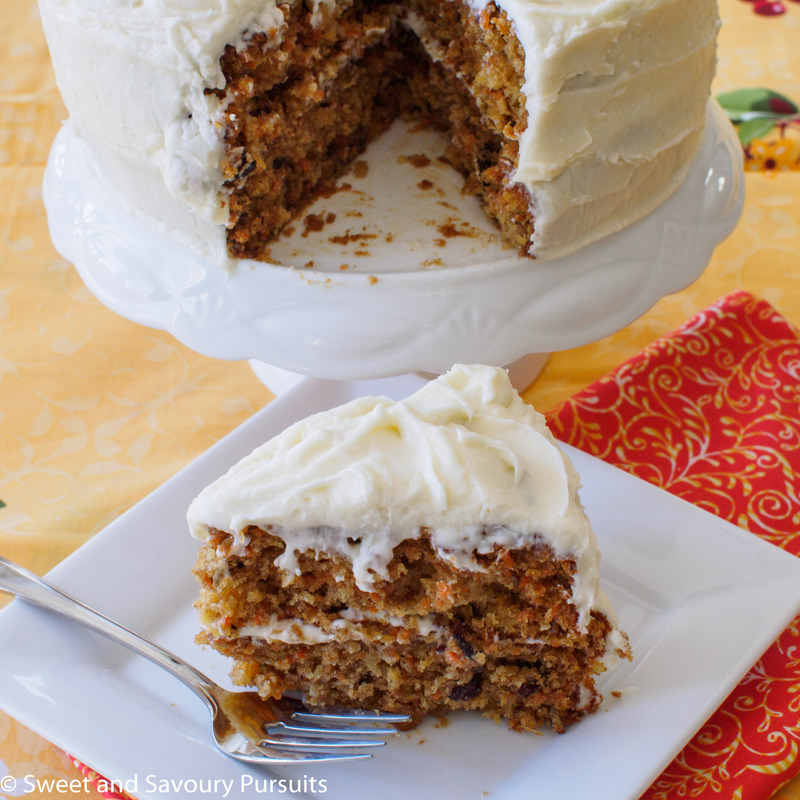 I’ve been craving carrot cake the last few weeks, and here you come with an amazing one! I love the substitutions you made. Isn’t it great when we make recipes our own by adding little tweaks here and there? So much fun! Well then you’ll have to try this recipe, it really is incredibly delicious! It looks so pretty and tasty with (nutmeg, cinnamon, pecans)! This is such a beautifully frosted cake and I can tell how moist it is by the looks of that lovely cross section. I like the substitution of whole wheat pastry flour for some of the regular flour, too. I bet it gives the cake a more wholesome flavor without sacrificing the moistness or overall flavor of the cake. Great idea! Thank you! Yes, honestly I think I could have used the whole wheat pastry flour the entire recipe and it would have been just as good. Next time I will try it that way.